Born in 1959 in Barrow-in-Furness, Cumbria (it was Lancashire then) to an Armenian father and Armenian/English/Irish/Swiss mother, I grew up in Coniston, never far from the shores of the lake. My mother must have taught me nursery rhymes at an early age, as I was later told I used to recite them with precision and enthusiasm as a small child. My father Melkon could on rare occasions be heard singing an Armenian or Turkish folk song. He had a fine and expressive singing voice, but was too reserved to sing in public. At about the age of seven, I remember being intrigued by the instrument played by the Dr Who of the time, Patrick Troughton. It was actually a recorder, but I thought it was a whistle, and I longed to have one of my own. My mother, Mavis, duly bought me a Clarke tin whistle on which I learned tunes by ear. If it had been the 1990s I'm sure I would have been similarly inspired by Captain Picard's whistle playing in Star Trek. I also yearned for a guitar and set about making one out of strong cardboard. It was going to be really good, but somehow the project was never completed. 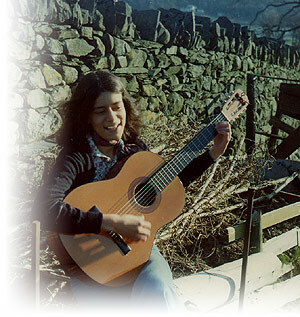 A few years later my first guitar, a classical one, was purchased from Leeds. I have often wished I had been properly taught how to play it. Instead I just made it up as I went along. For as long as I can remember, I liked to write poems and short stories. When I was about fourteen I began to write my own songs. One of the early ones, Cemetery Rock, I summoned up the courage to sing at a school concert, and it was well received. At around that time I and some of my singing and guitar-playing school friends would get together and practice songs. There would be the occasional opportunity to perform at a church or a senior citizen's party, or we would just sit and sing by the lake shore for the ears of passing sailors. These were not my own songs, but folk or pop songs of the time. There was not much opportunity to see live bands or performers, but one memorable occasion I remember is going to see Jake Thackeray at Theatre-in-the-Forest, just over the hill from Coniston. I'd never heard him before, but I thought he was great. That was in the 1970s. I married at an early age and brought up four children in a small two up, two down terraced house in Barrow-in-Furness. The house had no bathroom and only an outside toilet. I would boil kettles and pans of water to fill the tin bath in the kitchen for the children. That was in the 1980s! At that time, in between changing nappies, cooking and all those necessary things, I was writing poetry and the occasional song as well as learning new tunes on the whistle from books. (I could read music by then, I must have learned it during school recorder lessons). I would learn folk songs from library books. I still have recordings of myself practicing these songs with the sounds of my children playing or crying in the background. I listened to Folk on 2, but didn't have the time or money to go out in pursuit of live music. It was not until I moved to Bradford in 1992, now a single parent, that I began to discover folk clubs - first the Topic Folk Club - and realised one could actually sing one's songs there and people would listen. Since then I have written many more songs and sung them in lots of, mainly Yorkshire, clubs. More recently I got together with some friends and we formed Codarajo. We play some tunes and songs, traditional and cover versions, and do the occasional gig or busking session. But so far I seem to have reserved my self-penned songs for solo performances, or accompanied by my partner, Tony. In 2002 I began recording an album of fifteen of my songs at Alistair Russell's excellent Glade Recordings. Its completion was delayed somewhat by the discovery of a brain tumour which I had to have removed, but by June 2003 the album was finished. Most of the songs are complemented by a variety of talented guest musicians. The result, entitled City Light, is now available to the public.